The “Trip” films constitute the only movie franchise that matters. This is in large part because the movies themselves have absolutely no concern with being the kinds of pictures that “matter.” There are three such movies so far, all directed by Michael Winterbottom and all chopped down from mini-series of about double the feature’s length, and all starring comedic actors Steve Coogan and Rob Brydon. 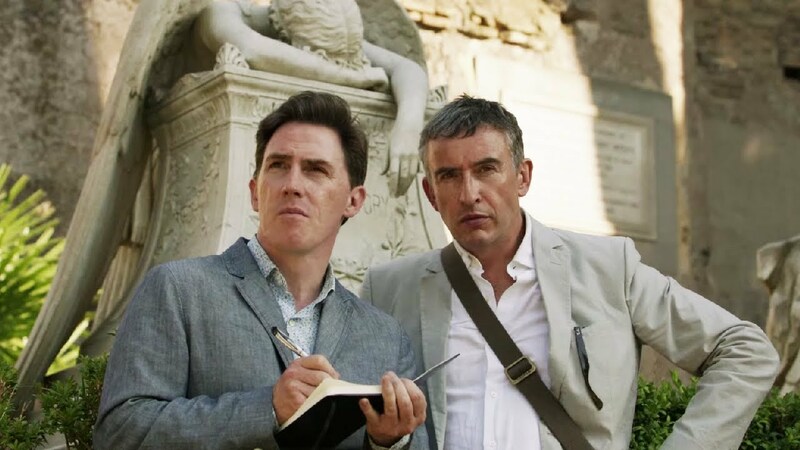 The movies, which started in 2010 with the just-plain “The Trip” depict Coogan and Brydon, playing themselves, tooling around a country sampling sites and restaurants, ostensibly for novelty newspaper pieces. The two play versions of themselves, and the attached storylines, which never really amount to anything crucial, center around the personal and professional anxieties of the two men. Coogan is more of an international hot property than Brydon, and has the inflated ego to prove it, but he’s also way more neurotic and insecure about the state of affairs than Brydon. But this sort of back-and-forth is of course merely narrative glue to hold together scenes in which the two masters try to outdo each other with competing celebrity impressions that are noteworthy and hilarious not just for their levels of accuracy but for the absurdist semi-satirical wit they yield. 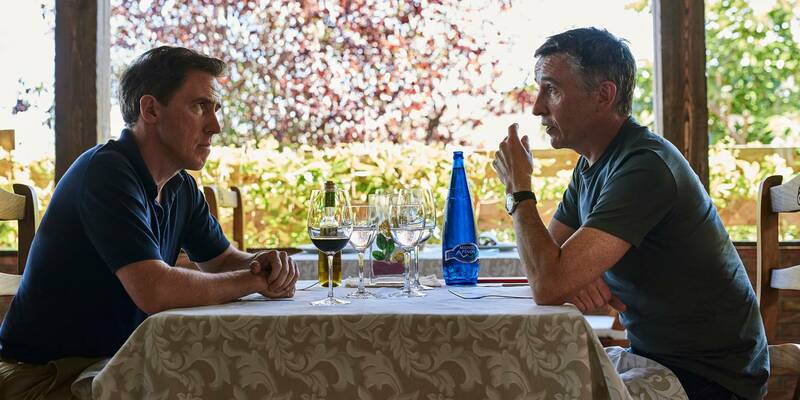 What they do best is of course exemplified in the second film in the series, 2014’s “The Trip To Italy,” in which Coogan and Brydon riff on the “Dark Knight” films by analyzing the two types of delivery Christian Bale uses in them—as Batman and Bruce Wayne—and moving on to the unintelligibility-at-any-speed of Tom Hardy’s Bane, and winding up of course with their dueling Michael Caine impressions. Your mileage may vary, but for me, that scene is a measuring stick of hilarity. Pretty much every time I watch it, I almost hyperventilate with laughter by the time they get to the “I don’t want to bury another Batman” stuff. If you feel similarly, you don’t need me to recommend “The Trip To Spain.” You’ll be on board, and you should be, because it has the goods. It begins with Coogan flying in from New York, with a crisp short haircut and an ego boosted by an Academy Award nomination for screenwriting “Philomena,” while Brydon is enjoying domesticity and child-rearing about as much as one is able when one of the children is two. (While Coogan and Brydon play their ostensible selves, the people in their lives, including Coogan’s “son” Joe, are fictional characters played by actors.) The newspaper offer is now a joint one, from the British Observer and the New York Times, and the publications will ask the duo to pose as Don Quixote and Sancho Panza at a photo shoot during the trip. You can guess who’s who. Except that when Coogan calls Los Angeles to talk to his agent about capitalizing on his screenwriting success, he’s found that said agent has left the firm, and he’s now being handled by his old agent’s former assistant. Later on, Brydon is surprised to get a call from Los Angeles … from, you’ll never guess, Coogan’s former agent, who promises Brydon the moon, including a shot at hosting the Golden Globes. It is fitting and proper that none of these plot machinations ever pop during the film’s running time. Insofar as they’re pertinent it’s only relative to the fact that the actors, and their characters, are turning fifty, and that’s a stock-taking time. “We’re ripe fruit,” Coogan says to Brydon with unusual enthusiasm. “You want to be plucked.” Both men are trim even as they engorge themselves on a variety of Spanish delicacy, including barbecue and what one of them calls “life-affirming butter.” The dimension of humanity only buttresses the humor. There are more “bits” here than in the prior films, and with one exception, they don’t go on as long. As the men ferry from England to Spain early in the film, we see Brydon in his cabin working on his Roger Moore impersonation. This pays off late in the movie when Coogan tries to show off his knowledge of Spanish history and the rule of the, you know, Moors. It’s only here that the movie pulls the trick of extending a joke until it’s not funny and then extending it further so it becomes not just funny again but funnier. Along the way, the movie has fun with buskers, Mick Jagger, and even the late David Bowie, who Brydon says very nearly name-checked him as a favorite funnyman on a radio interview except that he forgot Brydon’s actual name. All this and the ‘60s pop hit “The Windmills of your Mind.” I can hardly wait for the next one.